WHEN Narendra Modi became prime minister of India in 2014, opinion was divided as to whether he was a Hindu zealot disguised as an economic reformer, or the other way round. The past three years appear to have settled the matter. Yes, Mr Modi has pandered to religious sentiment at times, most notably by appointing a rabble-rousing Hindu prelate as chief minister of India’s most-populous state, Uttar Pradesh. But he has also presided over an acceleration in economic growth, from 6.4% in 2013 to a high of 7.9% in 2015—which made India the fastest-growing big economy in the world. He has pushed through reforms that had stalled for years, including an overhaul of bankruptcy law and the adoption of a nationwide sales tax (GST) to replace a confusing array of local and national levies. Foreign investment has soared, albeit from a low base. 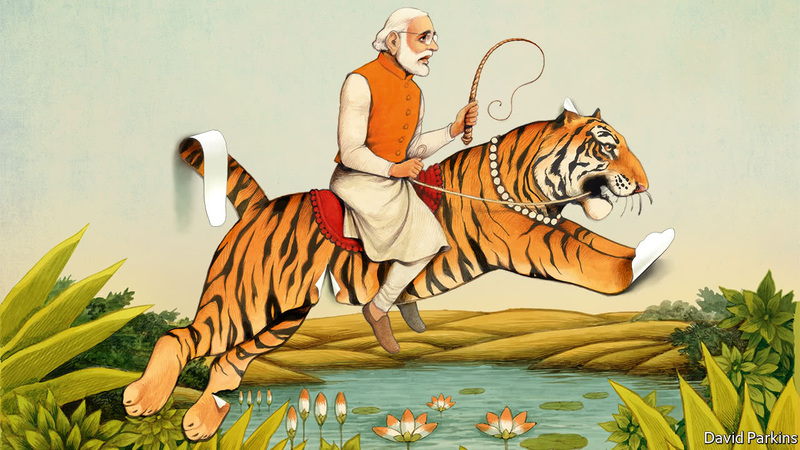 India, cabinet ministers insist, is at last becoming the tiger Mr Modi promised. Alas, these appearances are deceiving. The GST, although welcome, is unnecessarily complicated and bureaucratic, greatly reducing its efficiency. The new bankruptcy law is a step in the right direction, but it will take much more to revive the financial system, which is dominated by state-owned banks weighed down by dud loans. The central government’s response to a host of pressing economic problems, from the difficulty of buying land to the reform of rigid labour laws, has been to pass them to the states. And at least one of the big reforms it has undertaken—the overnight cancellation of most of India’s banknotes in an effort to curb the black economy—was counterproductive, hamstringing legitimate businesses without doing much harm to illicit ones. No wonder the economy is starting to drag. In the first three months of the year it grew at an annualised rate of 6.1%, more slowly than when Mr Modi came to power. India’s prime minister, in short, is not the radical reformer he is cracked up to be. He is more energetic than his predecessor, the stately Manmohan Singh, launching glitzy initiatives on everything from manufacturing to toilet-construction. But he has not come up with many big new ideas of his own (the GST and the bankruptcy reforms date back long before his time). His reputation as a friend to business rests on his vigorous efforts to help firms out of fixes—finding land for a particular factory, say, or expediting the construction of a power station. But he is not so good at working systematically to sort out the underlying problems holding the economy back. India does not just need power stations and parcels of land for development. It needs functioning markets for electricity and land—and capital and labour, for that matter. Lending to industry is contracting, for the first time in 20 years; Mr Modi should recapitalise state-owned banks and sell them off, to get loans flowing again. He should be working to simplify the over-exacting labour law, which perversely harms workers by deterring companies from hiring them formally. Property purchases are a forbidding quagmire; the government, at a minimum, should try to improve the quality of registers to reduce the scope for disputes. Political conditions are about as propitious for reform as they are ever likely to be. Mr Modi’s government is the strongest in decades. It has a big majority in the lower house of parliament and is edging closer to control of the upper house, as well. It runs most big states. The opposition is hopeless. There are economic tailwinds, too. India is a big importer of oil; the low price of late has been boosting growth by perhaps two percentage points a year. Ageing has long weighed on Western economies and is starting to sap China’s. India, by contrast, is still young. Over a quarter of the people joining the world’s workforce between now and 2025 will be Indian. And there is enormous scope for catch-up growth: India is the poorest of the world’s 20 biggest economies. By rights, it should be surpassing others’ growth rates for years. Mr Modi, in short, is squandering a golden opportunity. Some apologists claim that he is waiting until he wins a majority in the upper house before taking on bigger reforms. If so, he has given no inkling of what he is planning. In fact, he has not even made clear that economic reform is his priority. As prime minister, Mr Modi has been just as careful to court militant Hindus as jet-setting businessmen. His government recently created havoc in the booming beef-export business with onerous new rules on purchases of cattle, in deference to Hindus’ reverence for cows. Yogi Adityanath, the man he selected to run Uttar Pradesh, is under investigation for inciting religious hatred and rioting, among other offences. Under Mr Modi, debate about public policy, and especially about communal relations, has atrophied. Hindu nationalist thugs intimidate those who chide the government for straying from India’s secular tradition, or who advocate a less repressive approach to protests in Kashmir, India’s only state with a Muslim majority. One of the few media companies that dares to criticise the government has been raided by police on grounds that would not normally attract such heavy-handedness. Mr Modi himself has become the object of a sycophantic personality cult. The prime minister may intend all this as a way to keep winning elections. But it is not hard to imagine it going disastrously wrong. Mr Modi’s admirers paint him as the man who at last unleashed India’s potential. In fact, he may go down in history for fluffing India’s best shot at rapid, sustained development. And the worries about a still darker outcome are growing.